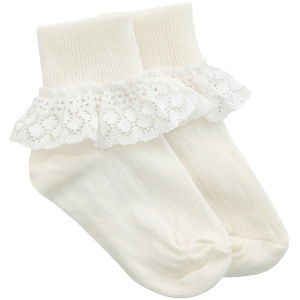 Beautiful girls ivory frilly lace socks for baby, toddler & junior. Perfect for a christening, flower girl / bridesmaid or communion. These beautiful soft ankle socks are plain ivory with a lovely lace trim to the ankle. Perfect to compliment her special occasion dress. Thank you for leaving a review. We are delighted to hear you are happy with your order.